It can be all too easy when temperatures drop to a certain (read: icy) level to lean on the same outfits you have for the past few years, huddling up in grey, navy and black knitwear and the same black ankle boots. While you can't beat a classic, if you're looking for some new winter combinations, the likes of Ada Oguntodu, Linda Tol and more have been wearing a number of practical yet still interesting looks you too will be able to wear on repeat until spring. Many of these key items you'll already own, such as turtlenecks and classic blazers, but you can make your winter wardrobe more 2019 with cream boots, leopard print and leather trousers. Scroll through the gallery to see 16 winter outfit ideas and combination that you can lean on during the cold snap. Style Notes: Jeanette's checked coat from Mango has been on our wish list for some time. We love how she wore it with a chunky roll-neck and jeans. Sadly it has now sold out, but you can shop a similar style below. Style Notes: Tiffany's doing the double-jumper thing instead of wearing a coat or jacket, and it makes us think this is a particularly good plan when you're commuting (less of the bulk and overheating involved with outerwear). Just wrap your jumper of choice around your shoulders to get the look. 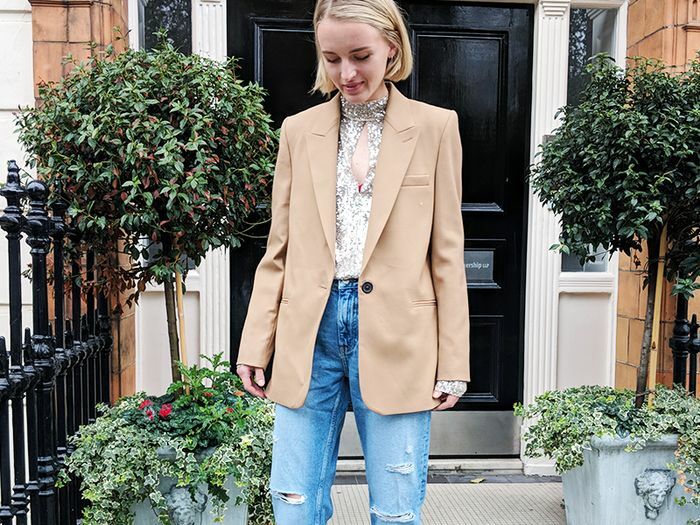 Style Notes: Not only has Hanna brought our attention to the powers of a strongly-belted coat, but she's also reminding us that cream boots are a go-with-everything win. Style Notes: Yellow continues to trend well past summer, and Ellie's making the most of it by top and tailing her slip skirt with wintry mustard pieces. So much happier than wearing a black knit, right? Style Notes: Roll-necks and blazers are the winter pairing of 2018. Throw in some checked trousers and you have yourself an entirely perfect cold-weather outfit like Grece's. Style Notes: Amira is defying all the rules by confirming that sneaks and tights do work. Style Notes: Who said head-to-toe white was only allowed in summer? Ada Oguntodu looks angelic in Zara's scarf jumper (we feel a trend coming on) and Wallace's white wide-leg trousers. Style Notes: ASOS's Lotte Williams gives us a lesson in how to wear your leopard-print skirt in winter. Apparently, it's all about the low-maintenance additions (think flat boots, a baggy knit and a biker jacket). Style Notes: Vinyl trench coats are big again this season, and we love how Tine Andrea paired hers with gold earrings, a black jumper and cropped raw-hem jeans. Style Notes: If there's one thing that unites a lot of influencers, it's got to be their love for an oversized fit. Case in point? Rikke Krefting with a dramatic ensemble belting an oversized blazer with a chunky roll-neck and skinny-fit leather trousers. Style Notes: Now is the time to stock up on knee-high boots and versatile separates like Hajra in this gorgeous floral midi, white roll-neck and black shoulder-robed coat combination. Style Notes: Heritage-check and grey suits like Linda Tol's are in demand this winter. Layer-up with a roll-neck and trench coat for extra warmth. Style Notes: We have so much time for this statement blanket skirt, which strikes just the right balance of traditional and trend-led. The white boots are a great addition (for new season kudos as well as warmth). Style Notes: Brown is a shade that instantly makes you feel cosy. This embellished handle Mango beauty will allow you to show off some chic leather gloves now it's colder, too. Style Notes: A thicker material like corduroy can be the layer you need to create extra warmth. Belt up to keep it snug and stylish. Style Notes: Split-hem jeans not only look effortless but they also show off more of your winter boots. Make like the one and only Leandra and go with Ganni.